SingleClue Cross-a-Pix are based on Tile Paint (Japanese: タイルペイント), an original puzzle from Nikoli invented by Toshiharu Yamamoto in Japan. According to Jimmy Goto, manager at Nikoli, Tile Paint first appeared in 1995 in issue 53 of Nikoli’s quarterly Puzzle Communication magazine and are being published regularly since then. In 2003, Hns Eendebak started creating hand-crafted SingleClue Cross-a-Pix puzzles in The Netherlands under the name Crazy Paving. Unlike Tile Paint, Crazy Paving require advanced logic to solve and don’t create a pixel-art picture when completed. Eendebak’s puzzles were published in the Dutch magazine Breinbrekers from 2004 to 2013 as well as in the British magazine Tough Puzzles by Puzzler Media. Today, Crazy Paving puzzles are published online by the WCPN (World Class Puzzles from the Netherlands) as well as in Conceptis Expert Puzzles, a series of PDF books featuring puzzles made by Eendebak and other expert creators from the World Puzzle Championships. In the summer of 2008, a dual clue variant of Nikoli’s Tile Paint concept was invented in Germany by Johannes Kestler, who named his invention Campixu. According to Kestler, as cited in Puzzler Media's website, the name was “inspired by the Latin word ‘campus’ (English: field) and by the word ‘pixel’, an allusion to the pixelated solution picture” of the puzzle. Between 2008 and 2012 Kestler's Campixu puzzles were published in Germany in his Logic Pixels magazine. According to Kestler’s website the puzzles were also published in Austria, Switzerland, France, Ireland, Spain and Argentina. Campixu puzzles are currently published in UK by Puzzler Media in their Beyond Sudoku and Puzzler Sudoku magazines. Similar puzzles are also published in Italy by NonZero under the name Polipix. In February 2015 Conceptis released Cross-a-Pix which includes SingleClue, DualClue, and Mega variants. 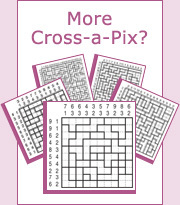 SingleClue Cross-a-Pix require analysis of one clue at a time and are easier to solve while DualClue Cross-a-Pix require analysis of two clues at a time making them more challenging to solve.